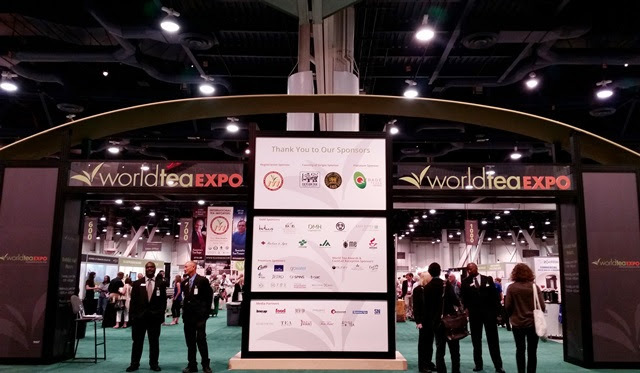 World Tea Expo 2017 took place at the Las Vegas Convention Center on June 13th through 15th. Day One had a slight twist on the usual schedule. In response to feedback requesting more networking time, the Exhibit Hall did not open until 3pm. 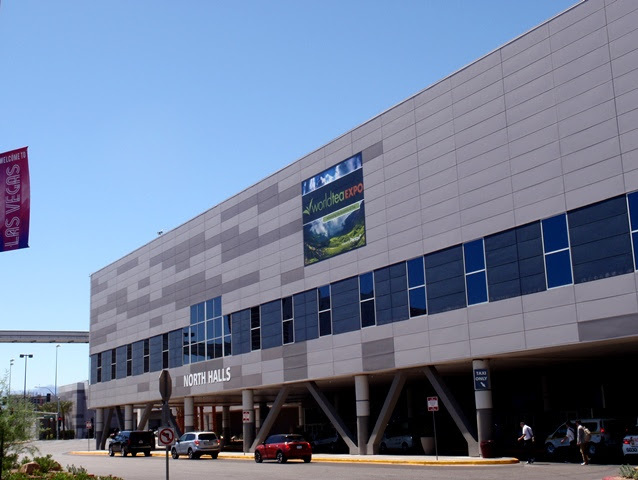 While I didn't get to meet many vendors on the first day, I did attend some noteworthy workshops and presentations. 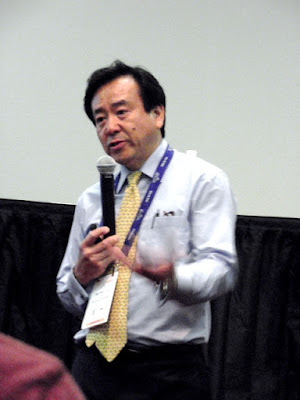 Dr. Fred Yoo (Professor, Kookmin University and Vice Chair, Korean Tea Society) presented this session to raise awareness of the Korean tea industry which has been thriving for centuries and yet is only recently gaining recognition in the west. Legend says that tea seeds was brought to Korea from India by princess Heo Hwang-ok (Princess Ho) as part of her dowry in 48 AD. Buddhist Zen Master, Cho'ui Seonsa, is often known as the Korean tea saint. He introduced tea ceremony in the early 19th century and in 1830 wrote ChaSinJeon (Chronicle of the Spirit of Tea), a transcription of a Ming Dynasty work, and in 1837 wrote DongChaSong (Hymn in Praise of Korean Tea). Korean tea growing regions are among the northernmost, with a temperate and partially subtropical climate and temperature variations in the high mountains that are ideal for growth. Eighty percent of the tea plants in Korea are a domestic variety. Ninety seven percent of tea production is in Gyeongsangnam Province (Hadong) where the tea plants are allowed to grow more wild, South Jeollanam Province (Boseong) where the tea plants are more aesthetically maintained, and Jeju Province (Ossuloc) where the tea is maintained in neat rows, similar to Japanese tea fields. Growing seasons are Spring (April-June), Summer (July-August), and Autumn (September-October). Wujeon tea is plucked and processed before April 20th. Sejak tea is plucked and processed between late-April and early-May. Joongjak tea is plucked and processed in mid-May. Tea leaves are plucked, pan-fired (ddeuk-um-cha), rolled, dried, and heated. Korean green tea is slightly roasted at a higher temperature than Chinese teas. Pre-heat the teapot and cup. Add 2 grams of tea to the teapot followed by 3.5oz/100ml of water heated 175° F/80° C.
Steep for 1.5 minutes for the initial infusion. Steep for 30 seconds for the second and third infusions. Add 3 grams of tea to the teapot followed by 3.5oz/100ml of water heated to 203° F/95° C.
Ideally the green tea color should be very clear and pale green with a golden tone. The aroma should be fresh, light, and long-lasting and the taste should be savory and very smooth with a rounded mouthfeel, slightly roasted notes, and less bitterness and grassy notes than other similar green teas. Dr. Yoo introduced us to a number of tea producers and tea masters who have been making important contributions to the Korean tea industry. Seonamsa (Seonam Temple) was established in 527AD in Suncheon, South Jeollanam Province and is one of the oldest temples in Korea. The monks of the temple have been producing tea since the late-9th century, using labor-intensive methods that include pan-firing and rolling the leaves approximately nine times. Hankook Tea Company was established in 1951, making it one of the oldest Korean tea companies. Not only are all their teas produced organically, they also have two generations of nationally recognized masters of yellow tea and powdered tea. Boseon Jeda is a second-generation family tea company, established in 1975. Their tea production process includes a combination of steam and pan-firing. Chunbo Tea Estate (Formay) has been producing tea for 20 years, specializing in high-grade green and black teas. Bohyang Tea Co. was established in 1937 and is currently being run by 4th and 5th generation tea farmers. In 2009, they became the first tea producers in the world to feed colloidal gold solution to their plants to produce Bohyang Gold Tea. Dadorak produces organic tea and has received the Korean Top Brand Grand Prize in 2016 and 2017. Boseong Woon Hae Green Tea was established in 1970 and is located near the sea where the mist rolls into the region, thus the name Woon Hae (Misty Cloud Ocean). Their teas are usually the first of the season. Jo Tae Yeon Ga was established in 1962 and harvests teas that grow naturally on Mt. Jiri. They are well-known for their Jukro Cha (bamboo dew tea). Ganging Dasan Tea was established in 1992 and produces organic teas. Ossuloc Farm is the only place in the world with three designations: Biosphere Reserve, World Cultural and Natural Heritage site, and Geological Park of Jeju Island. Development of the tea fields began in 1981. Danielle Hochstetter (Director of Tea, Teforia) graduated from Zhejiang University with a Masters in Tea Sciences and placed first in the Zhejiang University Mandarin Chinese competition for non-native speakers. In this interactive workshop, we learned about the broad variations in Chinese romanization, how the current standard for romanization compares to past systems, and how to accurately write and pronounce Chinese tea and place names. Writing is the same across China, even when pronunciation differs. In Chinese writing there are no spaces, not even after a period, and most characters are not pictographs (a common misconception). Many of the systems for Chinese romanization were developed by Europeans traveling to China including Wade-Giles (1892), Postal Romanization (1906), and Yale Romanization (1943). Systems developed by Chinese scholars include Gwoyeu Romatzyh (1928), Latinxua Sinwenz (1931), and Hanyu Pinyin (1958). To illustrate the challenge created by having so many systems, the following are examples of two famous Chinese teas and they names they are currently marketed under. This can and does create a lot of confusion for people in the tea industry and their customers. Hanyu Pinyin was approved by China's State Council in 1978 and accepted by the International Organization for Standardization (ISO) in 1982. In Taiwan, Hanyu Pinyin became official as of 2009. It's a useful system because it accurately reflects the pronunciation of Mandarin Chinese with consistent pronunciation of letters, children in China begin learning Pinyin in 1st grade, and the government has adopted it throughout China. The weakness to Pinyin is that there are so many different dialects that the same word can be read dozens of ways. One rule for Pinyin is that words, such as tea names, with 3-4 syllables should be brought together. Examples include Tieguanyin, Dahongpao, Baijiguan. Words with more than 4 syllables can be separated into words or brought together. Another rule for Pinyin is that place names should have no spaces and have only the first letter capitalized. Examples include Hangzhou (not Hang Zhou), Qimen (not QiMen), Anxi (not An Xi), Fujian (not FuJian), and Xihu (not Xi Hu). Cities names containing -shan (moutain) should have no spaces while mountain names should have a space before Shan. Examples include Huangshan (city) and Huang Shan (mountain) or Alishan (city) and Ali Shan (mountain). Pinyin has no hyphens, but it does have apostrophes which should be put before any syllable that begins with a vowel in the middle of the word. Examples include Tian'anmen, Lu'an, and Pu'erh. In the case of pu'erh, the outmoded Wade-Giles romanization "Pu-erh" is still in frequent use. Shortly before 3pm, we were treated to a high-energy lion dance performed at the entrance to the Exhibit Hall. 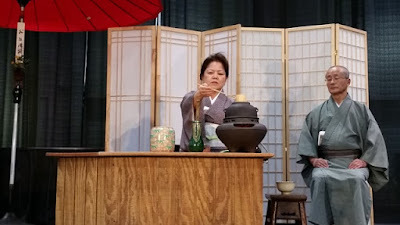 Chado Urasenke Las Vegas presented a Japanese tea ceremony with narration by Jodie Soen Cohen. 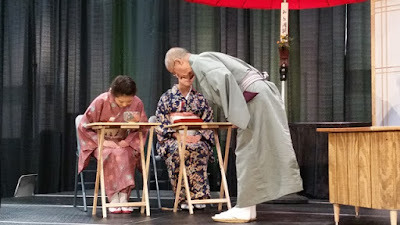 The teishu (host) was Kazuko Sowa Underhill and the hantou (assistant) was Rev. Shokai Kanai. Miyuki Miyamori was the shokyaku (main guest) and Jessica Drake was the kyaku (second guest). Nobuko Soshin Inuma, an Urasenke Los Angeles tea instructor with over 68 years of experience in the study of chanoyu, was also in attendance. Following introductions, Paula Patterson presented a brief history of Japanese tea and tea ceremony. The Buddhist monk Kūkai is believed to be the first to bring tea seeds to Japan from China in 806 and is credited with the first use of the word "chanoyu". In 1191, Buddhist monk Eisai brought back tea seeds from China for propagation and later wrote Kissa Yōjōki (Drinking Tea for Health). Murata Shukō is considered to be the founder of the Japanese tea ceremony, incorporating Japanese wabi-style (transient and austere) tea utensils which he described in the Kokoro no Fumi (Letter of the heart) in 1488. Takeno Jōō (1502-1555) was a follower of Murata Shukō's wabi-cha and developed a style of tea ceremony that differed from the popular style in Kyoto. Sen no Rikyū was a student of Takeno Jōō and went on to become the most influential figure in Japanese tea ceremony, refining and defining it in a way that is reflected in today's tea ceremony practice. 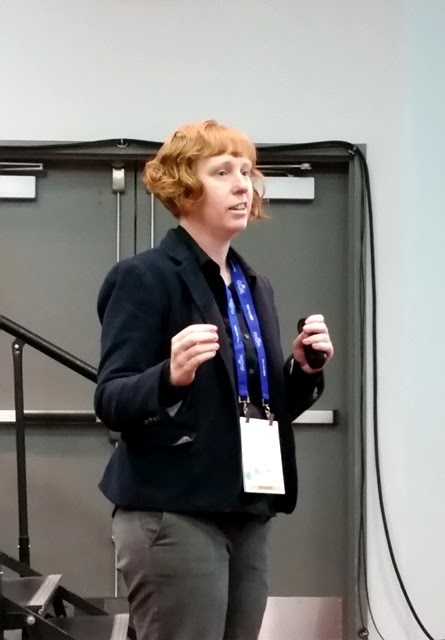 Jodie Soen Cohen provided narration throughout the presentation. She explained that the principle concept within tea ceremony is ichigo ichie (one chance, one meeting). Our time on earth is short and we have this one opportunity to have tea with each other. If we meet again, it won't be the same. Tea ceremony incorporates a vast range of disciplines including woodwork, metalwork, architecture, gardening, calligraphy, floral arrangement, and tea production. This style of tea ceremony utilizing tables and chairs is called ryurei. Each Urasenke iemoto (grand master) will create their own tea ceremony style and ryurei was introduced by Gengensai Seichu Soshitsu, 11th generation Urasenke iemoto, to allow foreigners to enjoy tea ceremony. Ryurei is also an excellent style when the host or guests have mobility limitations. The scroll reads "Wakei Seijaku". "Wa" is harmony, "Kei" is respect, "Sei" is purity, and "Jaku" is tranquility. The sweet container is Heian-style red lacquer. The first chawan (tea bowl) is red Raku and the second chawan features a motif of a carp and a sento spring. The mizusashi (water container) is bamboo yakkan and the natsume (tea container) is Sotetsu lacquer-ware (preferred by Urasenke). Had this tea ceremony taken place in winter, the hishaku (water ladle) would have been bigger. As the bowl of tea is presented to the first guest, they will turn to the guest on their left, bow, and say "osakini" or "osakini shitsureishimasu" which means "Excuse me for going ahead of you". When the next guest receives their tea, they will turn to the guest on their right, bow, and say "oshoban itashimasu" which means "Thank you for letting me join you". If there is a guest to their left, they will also bow to them and say "osakini".